Take your movement practices outside! Native Americans danced under the stars in all night ceremonies. Celts practiced their rituals in the forests and meadows on the high holy days. In China, many visit parks every morning to do Chi Kung or T’ai Chi. But where do most of us in the United States do ritual, meditation, and dance? With the exception of dancing at festivals and concerts, we are usually inside a home, club or studio. Most of our movement practices take place within four walls, cut off from sky, earth and natural surroundings. What if we took our meditation and movement outdoors to the sounds, smells and visual beauty of the Earth? 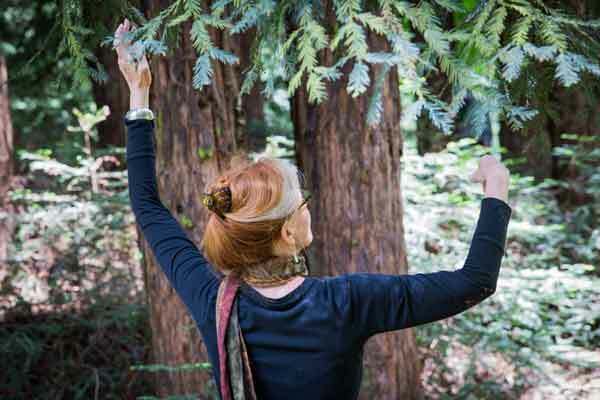 What if we radically shifted our view of movement practices to include connecting to nature as an essential healing ingredient? Imagine feeling free enough to go out to your yard or neighborhood park every morning for movement meditation. Envision the gentle touch of the sun softening your heart and lifting your arms in joy. By stepping outside, consciously breathing in the fresh morning air, or drinking in the crimson petals of a rose, you inform your body of its connection with the Earth. By bringing your movement meditation outdoors, you receive the energy and inspiration of your new dancing partner, you dance with nature. Even in busy and exhausting times, (I’m recalling my twins as toddlers), my five minutes outside each morning offered a life-saving, day-centering relief. I remember gulping in the whole garden through my breath, my eyes, my pores. Gathering energy through my T’ai Chi movements. Saluting the sun or stretching out a few of the aches. Opening my heart and spirit to the nourishment around me and sending out my intentions for the day. Nature offers infinite ways to experience movement and meditation. You can start by shifting your regular practice outdoors and consciously allowing your surroundings to influence you. If you don’t have a particular movement practice, you might begin with the simple intention of connecting with the Earth. Open your heart, spirit and mind. Let your body and intuition lead your movements, and follow your impulses and creativity. Sit in stillness and meditate on loving-kindness or on peace. Jump, dance or swirl. Read a poem, or feel inspired to write one. This time could be a simple waking up and centering for the day or a deeply healing experience. When I enter my outside space, I often begin asking myself what I want or need physically, emotionally, spiritually and mentally. If I am tired or emotionally spent, I choose a grounding, breathing, imagery meditation or chakra breath meditation. If my body feels stiff I start with yoga or improvised stretches. Often, I get my energy flowing with T’ai Chi or do a variation of Authentic Movement. For most of my adult life, I have retreated to the outdoors to reflect, meditate, and perform movement practices on my own. Last year, I felt a strong calling to invite others to share my practices in nature. At the first gathering of my “Meditation and Movement in Nature” group, I was astonished to learn that moving with others enhanced the spiritual force of nature around me and within me. During one session, we danced the qualities of Earth, Air, Fire and Water, exploring their presence in the world and the role of these gifts in our daily life. We drew, wrote and shared about our experiences together. The shift from indoor to natural settings can be easy if you invite your established groups, classes or friends to join you. What you do can be simple. Someone in my group said “You could have led anything and it would have been fine!” Being in a beautiful setting with the intention of connecting to yourself, the earth, your spirit and others is a profound experience in itself. I imagine a world in which people frequently move, meditate, and dance in parks and gardens and on beaches and mountains. In this world, our relationship with nature would be an integral part of ourselves and our bodies. A Native American saying “Mitakuye Oyasin” or “all my relations” speaks to our essential connection to all parts of the natural world and to each other. In these pivotal times, may our commitment to caring for the Earth spring forth from these interconnected relationships.